(CNN) -- Was Barack Obama really born in America? The U.S. Constitution says only "natural born" citizens can become president -- a vague clause that some members of the birther movement contend disqualifies Obama because, they insist, he was born outside the United States. CNN investigators in Honolulu found nothing to reinforce those doubts. Dr. Chiyome Fukino, a former director of the Hawaii Department of Health and a Republican, told CNN in her most extensive comments to date that she has "no doubt" Obama was born in the state. Obama's 2008 campaign produced a certification of live birth, a document legally accepted as confirmation of a birth and routinely used for official purposes. Fukino went one step further, taking advantage of a state law that allows certain public officials to examine a person's actual birth certificate if there is a "direct and tangible interest." The president's certificate, she said, is stored in a vault in the building that houses the Department of Health. Ironically, unlike the certificate of live birth, it is no longer accepted for official usage. Obama's certificate is "absolutely authentic," she said. "He was absolutely born here in the state of Hawaii." 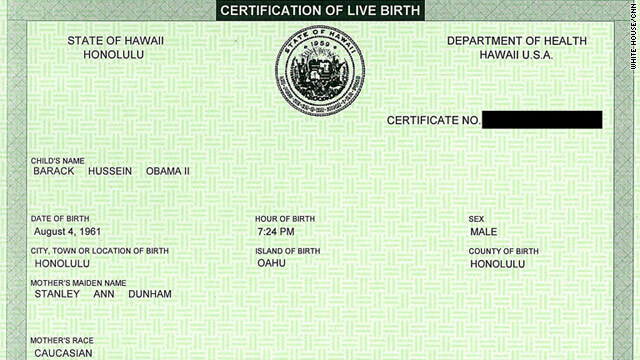 Arizona governor criticizes birther "distraction"
To see what happens when someone born in Hawaii requests a birth certificate, CNN asked a current resident of the state -- Stig Waidelich -- if he could get a copy of the document. Waidelich was born hours after Obama in August 1961. Like Obama, Waidelich's birth was announced at the time in the Honolulu Star-Bulletin newspaper. Waidelich, like Obama in 2008, was given a certification of live birth in response to his request. Could Obama's 1961 birth announcement in the Honolulu Star-Bulletin be a fake? Some conspiracy theorists say yes. Longtime Honolulu newspaper reporter Dan Nakaso says no. "It's not possible," Nakaso said. "Under the system that existed back then, there was no avenue for people to submit information that way. ... The information came directly from the state Department of Health." Indeed, as CNN confirmed, all birth announcements at the time came directly from hospital birth records. Could Obama, a self-proclaimed Christian, be preventing the distribution of copies of the original birth certificate because it identifies him as a Muslim? Fukino says no. The original certificate includes no mention of the president's religion. And indeed, other original certificates from that time don't mention faith. Obama could file a Freedom of Information Act request to view his original birth certificate and make copies. But at this point, the White House maintains, nothing will satisfy the doubters. Rick Smethurst, a 2008 John McCain voter who now lives in Obama's childhood home in Hawaii, counts himself among the doubters. He said he wants to find someone who saw Obama immediately after the president was born. Hawaii Gov. Neil Abercrombie said he did. Abercrombie, a Democrat, was friendly with Ann Dunham, Obama's mother, and remembers celebrating the birth. "Of course, we had no idea at the time that the future president of the United States was that little boy, that little baby," Abercrombie recalled. But "we are very, very happy ... that took place." Professor Alice Dewey of the University of Hawaii was a faculty adviser to Dunham and also knew the future president when he was a child. She called the controversy "funny." She said there is "no way" Obama wasn't born in the state. Dewey remembered a conversation in which Dunham compared the birth of Obama with that of his sister, Maya, who was born overseas. "She said, 'When I had Maya, it was a lot of more difficult because Indonesia doesn't believe in painkillers while you're giving birth. ... Of course, in the United States, giving birth to Barry (Obama's childhood nickname) was quite different and much more comfortable,' " Dewey recalled. Waidelich's mother, Monika, said she believes she saw Obama in Honolulu's Kapi'olani Medical Center next to her son in 1961. "In those days, there were hardly any other black babies," she said. The hospital wouldn't show patient records from 1961, but the state's African-American population was less than 1% at the time. Regardless of the evidence, there may be no convincing some of those who question the president's origins. "I find it a bit amusing in the sense that (the issue) keeps resurfacing over and over again," Fukino said. "It really tells us that the whole conspiracy notion is out there (and) that if there is an issue that needs a following, they will find one. "No matter what you do or say, it make no difference," she said. Abercrombie, who tried to put an end to the controversy when he became governor, said he hopes that "people who have this political orientation toward the president respect us here in Hawaii." "Respect his mother and father," the governor urged. "Respect the people I loved and the people that I knew, and the little boy who grew up here in paradise and became president." That, the evidence suggests, may be easier said than done.